The RCUK-funded project helped understanding how people engage with (smart) e-cycling in the UK and was let by Dr Behrendt at the University of Brighton. It identified key issues for policy, design and research that enable a higher uptake of e-bikes in the UK, and thereby reduce carbon emissions. The infographic visualises key findings. The brochure below summarises key points. E-bikes may help to increase the initial appeal of cycling to those less likely to cycle including women, older age groups, non-white ethnic groups, those who are currently relatively inactive, car owners and users and those living 3–10 miles from work. In the commuter trial, 75% of those who borrowed e-bikes reported that they typically used them at least once a week and car miles driven dropped by about 20% during the trial, averaged across all participants. 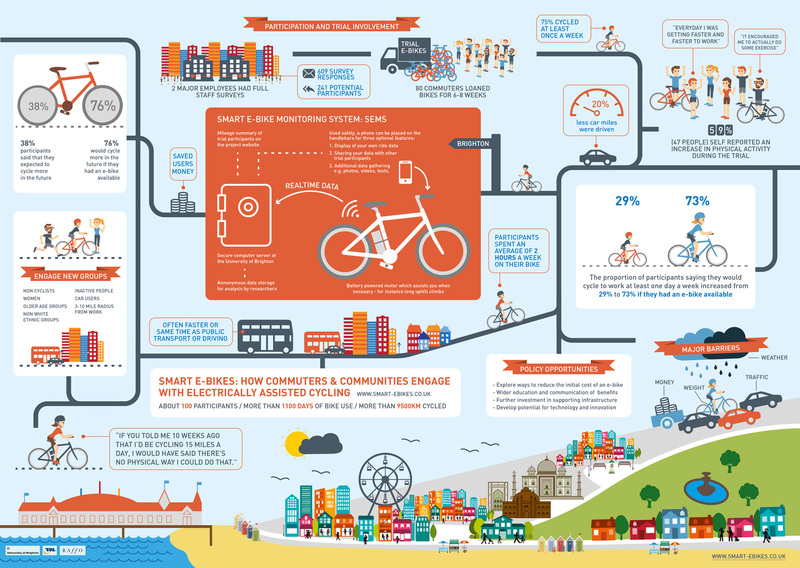 Policy activities are important to support uptake of e-bikes in the UK (see below). Other European countries have had very successful programmes to encourage e-bike take-up and use. How was the research data collected? Surveys were undertaken at two large workplaces in Brighton about travel habits and interest in electrically-assisted bikes. Subsequently, 80 commuters were loaned bikes for 6-8 week periods. Interest in e-bikes was also assessed through public events, a community-based trial, and through review of the international literature. A smart monitoring system was installed on the trial fleet of 35 e-bikes to collect usage data in real time. Data from interviews and focus groups was coded in NVIVO. The e-bikes used in this project look similar to normal bicycles but have a small electric motor (powered by a rechargeable battery) that can be switched on to assist the rider. The amount of support from the motor reduces with increasing speed, and cuts out altogether once the bike reaches 25kmph, or if the rider stops pedalling. Who might want to use one? E-bikes might encourage more people to cycle – or encourage people to cycle more. They make it easier to cycle uphill, against the wind, with heavy loads (children, shopping) or for longer journeys. They also have benefits for commuters who want to arrive unruffled, older age groups, people with physical limitations, tourists and last mile delivery of goods. Is e-cycling healthy and active? 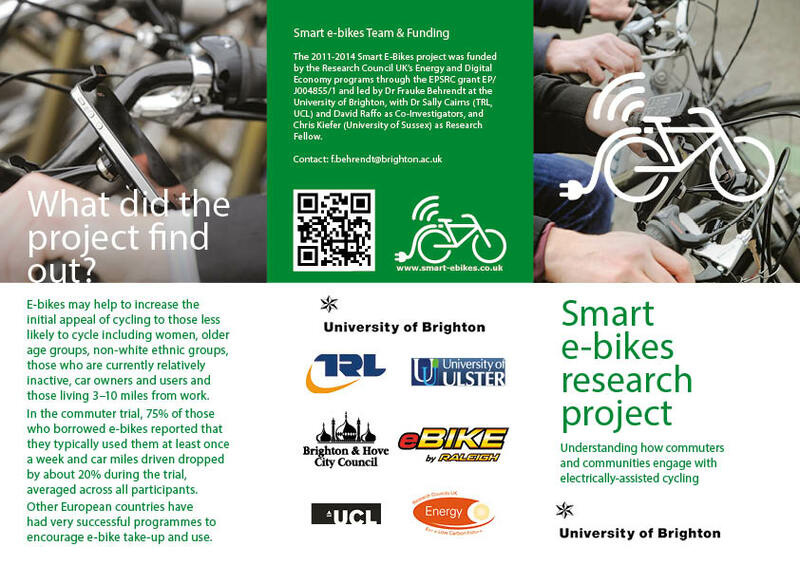 The 2011-2014 Smart E-Bikes project was funded (£442,845) by the Research Council UK’s Energy and Digital Economy programs through the EPSRC grant EP/ J004855/1. In partnership with Brighton & Hove City Council, the project had additional funding through the Local Sustainable Transport Fund. The project was led by Dr Frauke Behrendt at the University of Brighton, with Dr Sally Cairns (TRL, UCL) and David Raffo as Co-Investigators, with Chris Kiefer (University of Sussex) as Research Fellow and Clare Harmer (TRL) as project researcher. Research support from TRL also provided by Simon Ball, Katie Millard and Su Buttress, andAlan Summers (University of Chester) also contributed to the research. The advisory panel included: Dr Andy Cope (Sustrans), Prof. Derek MacAuley (The University of Nottingham), Prof. Nanette Mutrie (University of Strathclyde), Dr Lynn Sloman (Transport for Quality of Life), Dr Walter Vogt (University of Stuttgart). The project worked partners from the public and private sector including Brighton and Hove City Council, Raleigh UK, M’sCycles, Baker St Bikes and Bupa International. This project was part of the larger research network Travel Behaviours Network. 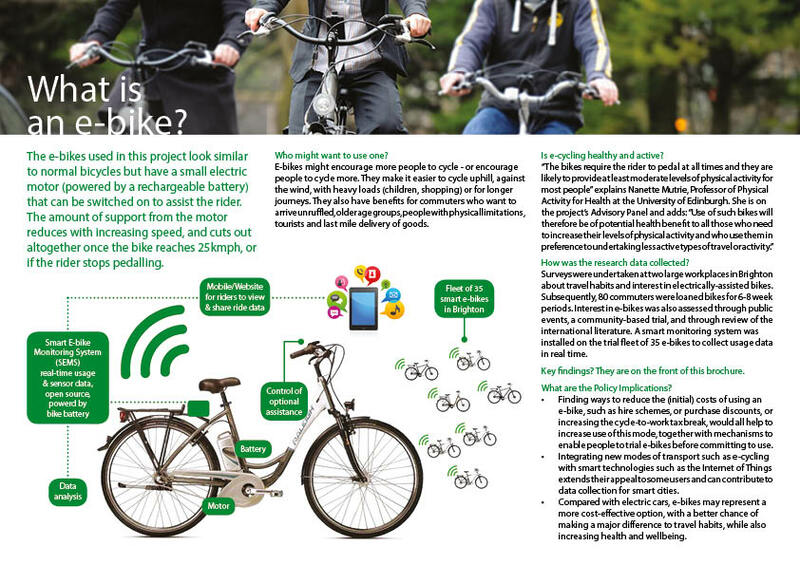 More information about the project is under Smart E-bike Monitoring System, Blog and Press.